A pencil is a little wonder-wand: a stick of wood that traces the tiniest motions of your hand as it moves across a surface. I am using one now, making weird little loops and slashes to write these words. As a tool, it is admirably sensitive. The lines it makes can be fat or thin, screams or whispers, blocks of concrete or blades of grass, all depending on changes of pressure so subtle that we would hardly notice them in any other context. (The difference in force between a bold line and nothing at all would hardly tip a domino.) And while a pencil is sophisticated enough to track every gradation of the human hand, it is also simple enough for a toddler to use. Such radical simplicity is surprisingly complicated to produce. Since 1889, the General Pencil Company has been converting huge quantities of raw materials (wax, paint, cedar planks, graphite) into products you can find, neatly boxed and labeled, in art and office-supply stores across the nation: watercolor pencils, editing pencils, sticks of charcoal, pastel chalks. 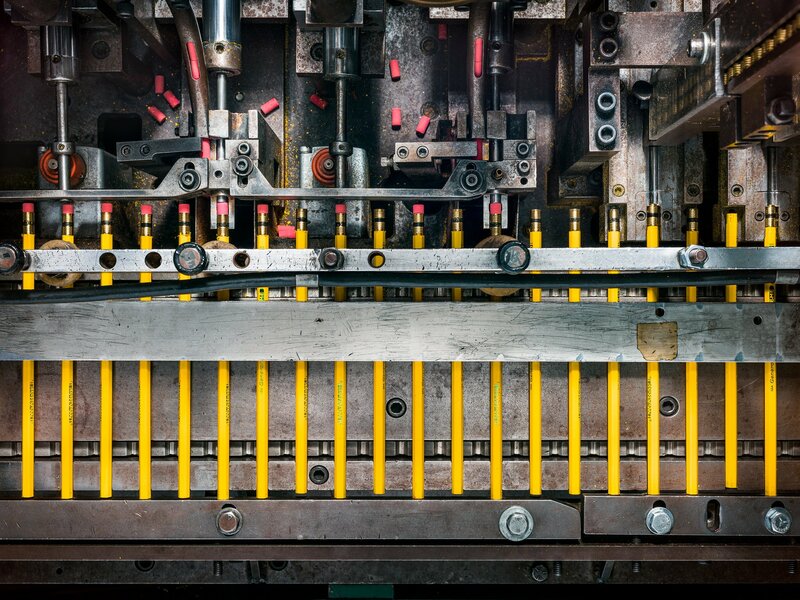 Even as other factories have chased higher profit margins overseas, General Pencil has stayed put, cranking out thousands upon thousands of writing instruments in the middle of Jersey City. Like most other human artifacts, the common pencil, made and sold today by the millions, has a long and complex history. Henry Petroski, who combines a talent for fine writing with a deep knowledge of engineering and technological history, examines the story of the pencil, considering it not only as a thing in itself, but also as an exemplar of all things that are designed and manufactured. Petroski ranges widely in time, discussing the writing technologies of antiquity. But his story really begins in the early modern period, when, in 1565, a Swiss naturalist first described the properties of the mineral that became known as graphite. Petroski traces the evolution of the pencil through the Industrial Revolution, when machine manufacture replaced earlier handwork. Along the way, he looks at some of pencil making’s great innovators–including Henry David Thoreau, the famed writer, who worked in his father’s pencil factory, inventing techniques for grinding graphite and experimenting with blends of lead, clay, and other ingredients to yield pencils of varying hardness and darkness. Petroski closes with a look at how pencils are made today–a still-imperfect technology that may yet evolve with new advances in materials and design. It’s such a ubiquitous object that very few ever take the time to think about. It used to be, anyway, top of the list for every new school year: Pencils and notebooks. Do kids even write anymore? Judging by the penmanship (or lack thereof) demonstrated by some middle-schoolers I interacted with recently, it sure doesn’t seem like it (except the girls; they generally wrote well). But it really goes to the heart of the cultural elaboration that writing is for our species. People used to scribble a lot on pretty much anything to hand, predominantly potsherds where such were available (and where there was a writing system) which was a cheap and easy form of communication, what RC Dunnell used to call “time transgressive” objects: they persist through time unlike the spoken word. It (writing) meant that you could translate your spoken/unspoken words to a time- (and space-) transgressive object and therefore communicate your words across space and through time, not just to one person but to many. 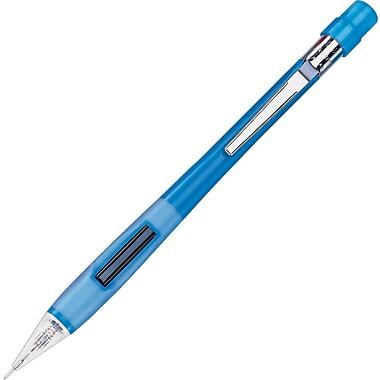 The pencil, once the vast background infrastructure was developed to make them cheap and easy to produce and sell, delivered that to the masses. Granted, I’m not a traditional pencil user. I much prefer pencil to pen for notes and just about anything else, but I rarely use traditional wood pencils. I’m a mechanical pencil guy and have been for most of my life. I like the sharp consistency of the “lead” in mechanicals, plus the fact that you never have to sharpen it and make a mess with the shavings. Though admittedly getting up to sharpen ones pencil provided a handy excuse to get up and wander around, and perhaps check out some of the girls in the class. . . . . .
My personal all-time favorite mechanical pencil is the Pentel with the side-clicker because you don’t have to move your fingers around much to advance the “lead”. Plus it’s a bit fatter where you grip it. I also use a slightly softer “lead” for it; on the HB scale where “HB” is about equivalent to the standard #2, I get one softer, the B. I just like the smoothness and darker line it produces. One thing of specific archaeological note: I discovered that Rite In The Rain produces a field pencil. I tried it out and at first didn’t much care for it, mostly because it uses a 1..1 mm “lead” which I don’t really like, but I’ve gotten used to it. I remain wary of using an $11 pencil out in the field — because, you know, I’m always losing things — but so far it’s worked out well. So sometime today, take a moment out to consider the humble pencil. Pick it up, write something with it and know that you are utilizing one of the true wonders of mankind. We take a LOT for granted. I read in an anthology years ago a sci-fi/fantasy of an auto exec who sold his soul to the devil to time travel with the blueprints (and money) to start building cars before Henry Ford–and found that the specs couldn’t be met yet. I naturally write rather small, and prefer a 0.5mm. Fountain pens can be nice too–until you spill water and realize why ballpoints rule the market.